An upgrade was made to the gin pole to more securely attach it to the mast. 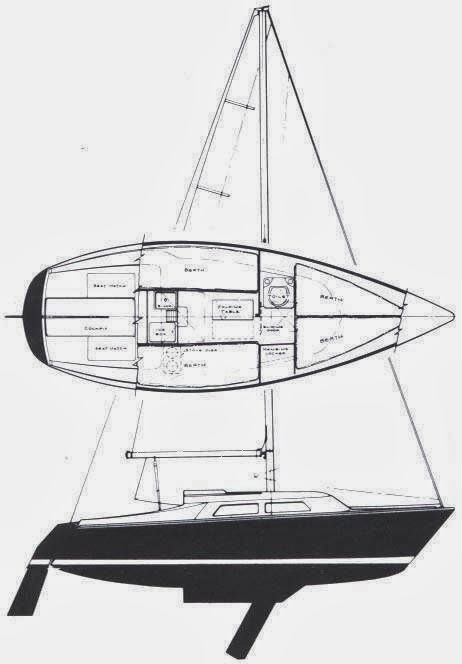 I had to lower the mast myself, and didn't want any surprises. I used a ratchet strap which broke a while ago. It was screwed it onto the pole in a way that didn't allow too much movement, but still let the ratchet work normally. 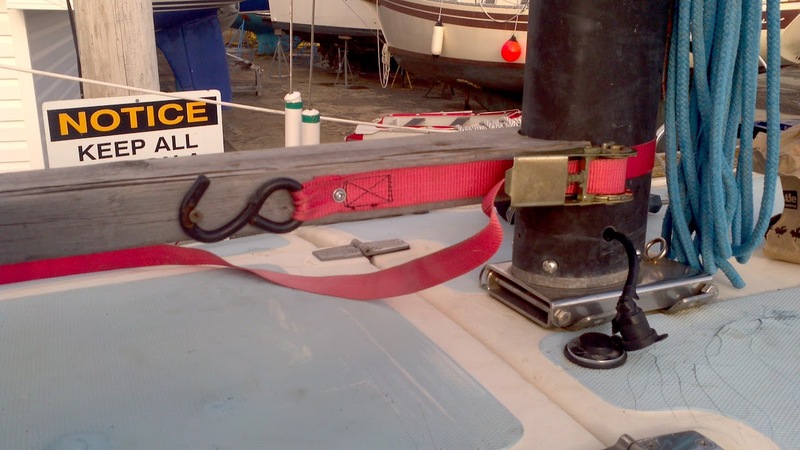 This holds it much more securely to the mast than the straps and ropes I had tried before. I used the jib sheets attached to the end of the gin pole, and positioned through the track blocks just aft of the spreaders to keep it stabilized. 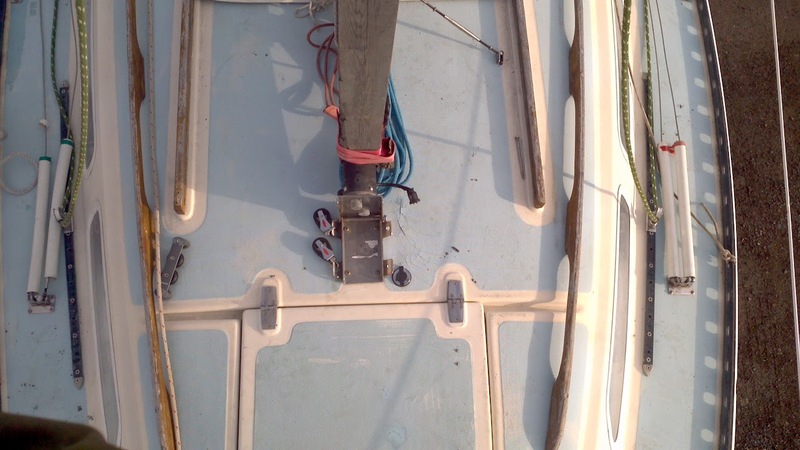 There was a light crosswind, so I also added a safety line from the mast down to the toe rail on the windward side, just in case a gust came at a bad time. Everything went according to plan, and Serenity is now safely home in my driveway. There are still some more improvements I can make, but the system I have now works well and makes it possible for one person to safely raise and lower the mast. I like the way you've made the gin pole, I may have to steal that idea. 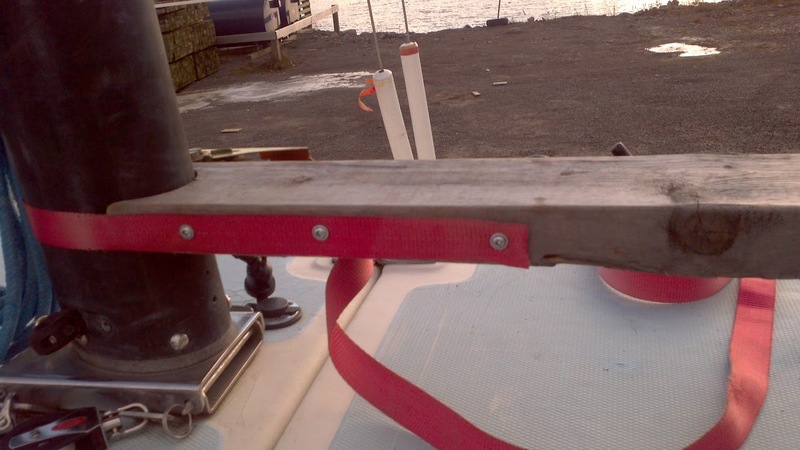 I've got to lower Sprite's mast this spring as the mast step is sagging. A common problem on the Seawych. Mark, one purpose of this blog is to share and exchange ideas, so feel free to "steal" anything you want from here. My pole was built from ideas borrowed from other people. And, thanks for commenting. It was a rare treat. Our season is not all that short. Most people are in the water from the middle of May to the middle of October. That's 5 months, although, the weather is inconsistent. 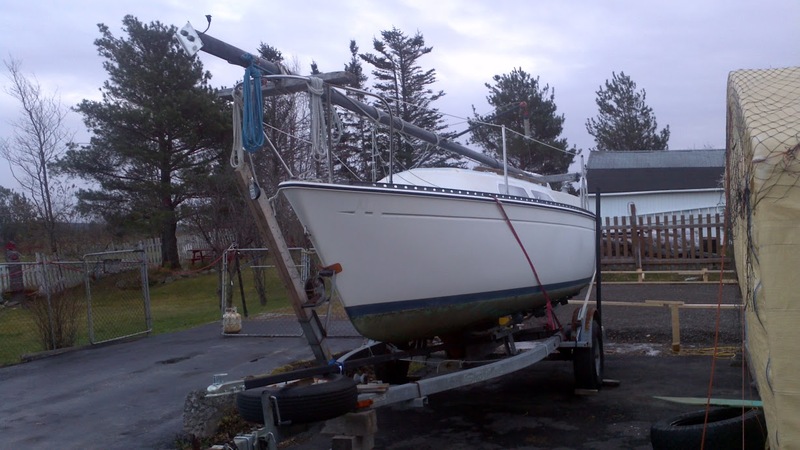 Depending on the boat, and the toughness of the owner, the season can be pushed to 7 or 8 months. That said, the best boating runs for 3 months from July to September.